The shell stitch is one of my favorite stitch patterns. It has such a pretty look. Last summer, after finishing a shell stitch hat, I thought it would be fun to use the last of the skein to make a little something to match the hat. 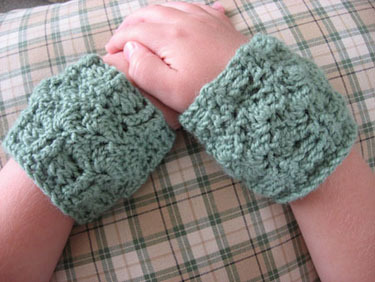 These cuffs are the happy result. Yarn over, insert hook from back to front around post of indicated st on previous row, continue with hdc. Yarn over, insert hook from front to baci around post of indicated st on previous row, continue with hdc. For a finished look, sc in each st around. Fasten off. Sc in each chain at the base of the cuff. Fasten off and weave in all ends.